At Kaizenprint we love creating brands, strengthening customer relationships and helping businesses. A way of strengthening customer relationships can be through loyalty programmes. They increase retention, encourage repeat purchases and can lengthen relationships. Customer experience is created by delivering positive customer experience and by providing unquestionable value to a customer through your product or service. Not only do loyal customers create revenue through their own purchases, but they will also share their experiences; in turn bringing in new customers. That’s a win-win situation. So, how can a Loyalty Card assist in creating true customer loyalty? We’re going to let you in on our 5 creative ideas that you can incorporate into your Loyalty Cards. Do you truly know what your customer values? Customer loyalty isn’t always down to the monetary value of your product or service. If you think outside the box you may discover they have more important values, such as helping others. If your business is based on ethical productions and helping the environment, your customers may be opting to buy from you because they prefer your products or services compared to less ethical companies. The brand TOMS Shoes is dedicated to improving the lives of others and promises that with every purchase, they will donate a pair of shoes to a child in need. The company has recently taken this initiative even further by attempting to improve health care and introduce clean water in such deprived areas. Of course, your loyalty scheme doesn’t need to be this drastic, for instance, you could simply promise to donate a certain amount of money to a chosen charity once your customer has achieved 10 stamps on their loyalty card. This format has been used by many businesses and is seen increasingly important as customer focus is substantially shifting to ethical products and services. Strategic partnerships can be an effective way to both retain & grow your customer base. Through developing strategic partnerships, your partner will also benefit from the same positive advantages and customers will feel as though they are getting extra value for their loyalty and money. Of course, as customers are understanding authenticity more and more each day, you must choose a partnership that ties in well with your brand offering. For example, if you operate a nail salon you could partner with a hairdressers to offer a co-branded deal as a loyalty reward. Or, if you’re a coffee shop owner, you could consider partnering with a local bakery. Not only does this provide added value to your current customers, it will also provide you with access to your partner’s network. When planning a strategic partnership for your loyalty card, you should try to keep it as simple as possible to avoid confusing your customers. Do you remember when Uber and Spotify partnered to allow members to take control of the music during their journey? That was great! 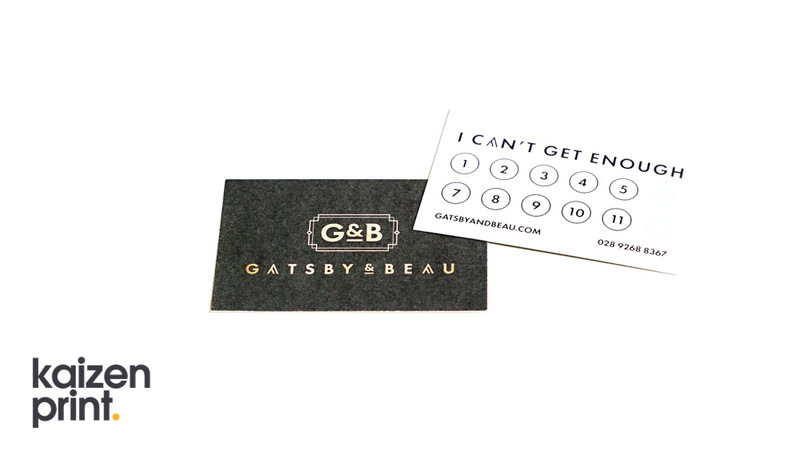 A successful loyalty card will become an extension of your brand and should reflect who you are as a business. Does the branding fit in with everything else you have done? Think about the colours and typography you wish to use and whether it creates a coherent feel. Be creative and not universal. You don’t want your customer to be able to receive exactly the same from your competitor – so illustrate your personality and showcase why you’re truly different. By incentivising customers to share your brand with their friends, you will reap the rewards from gaining new customers. For example, “give your friend this Loyalty Card and we will give you both 50% off your next treatment”. Short, sweet & simple! By giving your customer’s status, you are enhancing their experience which in turn encourages them to share this with their friends, family and work colleagues. Starbucks is a good example of a company that successfully creates this environment for repeat customers and is often replicated by other restaurant and cafes. How could you incorporate the feeling of being a VIP into your loyal programme? It could cost you little, but make a repeat customer feel very special. Here at Kaizenprint we believe if you’re not rewarding loyalty you are losing business. To see our Loyalty Cards click here – Printed at 85x55mm on our 350gsm uncoated card stock our Loyalty Cards are perfect for generating repeat business. As always, feel free to contact us here at Kaizenprint if you have any questions regarding your own projects. Our dedicated team of Design and Print experts will be happy to help: 028 9002 2474.